I find it cool when a poison has a literal killer history, yet finds use in hospitals around the world as a valuable medicine. That’s the story of physostigmine, an alkaloid found in Physostigma venenosum, the Calabar bean, and where we will start this tale. 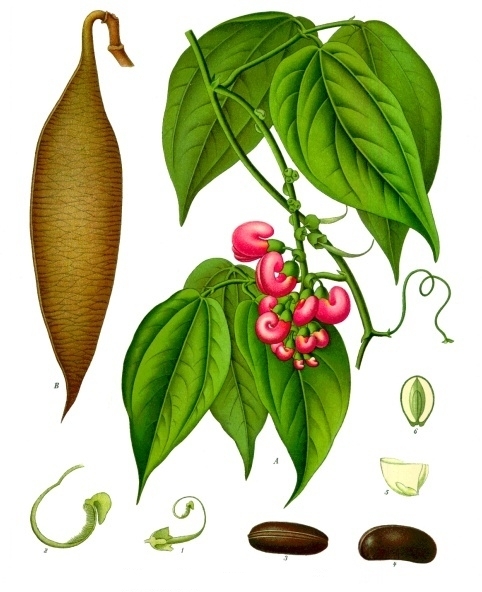 The source of the Calabar bean, Physostigma venenosum, is a climbing, perennial legume. It can reach heights of up to 50 feet, and puts out long seed pods holding 2 to 3 seeds. And it is theses seeds that hold the chemical used as the previously mentioned ordeal poison: physostigmine. Now obviously physostigmine can not decide one’s guilt or innocence, we’ll leave that up to truth serum. But what it can do is act as a parasympathomimetic drug, or the easier-to-say cholinergic drug. Physostigmine works on the parasympathetic nervous system (PNS) by inhibiting the enzyme cholinesterase, thus increasing acetylcholine. The PNS is the part of our nervous system that is responsible for the so-called “rest-and-digest” activities. There are many mnemonics to remember these activities, and the one I use is SLUD: Salivation, Lacrimation, Urination, and Digestion. So if one were to be poisoned by an anticholinergic drug, say scopolamine (how convenient that I’ve written about that before), they would be plagued by the symptoms one would suspect of a drug working against the PNS. Mild symptoms would be dry mouth, urinary retention, and inability to poo – just what you would expect of something working against SLUD – and more advanced symptoms would include confusion, agitation, and seizures (MDs would call it myoclonic jerking. Who comes up with that?). Need an antidote, and fast? Try a calabar bean! That might work at Hogwarts, because for some reason I always think of a calabar bean like a bezoar. If you have no idea what I’m talking about, please excuse my geekiness. Anyways, your ED doctor hopefully isn’t going to pull a magic bean out of his pocket, but he is likely to give you a dose of physostigmine. And this is exactly what happened when a 15 year old girl ingested Jimson weed, Datura stramonium, a plant that contains the anticholinergic drugs atropine and scopolamine, and often used for its hallucinogenic effects. She presented to a Toronto ED with tachycardia, mydriasis (dilated pupils), and a generally “out of it” state. The common course of treatment, benzodiazepines, did not help, and it was at the suggestion of the local Poison Control Center that they tried physostigmine – with success of course (2). That’s my kind of doctor: “Screw what y’all think works, I’ll just stick with my magic beans.” And perhaps things haven’t changed that much, or at least maybe they shouldn’t. Physostigmine is probably underused when patients present with anticholinergic syndromes. The “standard” (for seemingly everything) is to load them up with benzodiazepines, but outcomes may actually be better with physostigmine (7). Physostigmine is probably underutilized because doctors are not as familiar with it, but it should be investigated when presented with a patient with anticholinergic seizures that do not respond to benzodiazepines, and run the risk of being over-sedated (8). This is why having a good medical toxicologist on staff is important. 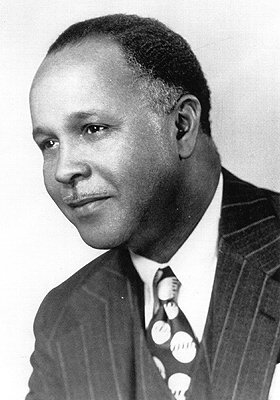 And I would be remiss if I, as a synthetic organic chemist turned toxicologist, did not mention that the first synthesis of physostigmine was accomplished by Dr. Percy Julian in 1935 (9). As an African-American attending school in the 1920′s Dr. Julian faced incredible odds and discrimination in his quest to earn his doctorate, which he finally earned in Vienna, Austria in 1931. But apart from his work with physostigmine, he is probably more well known for his work on steroids. I come from the Carl Djerassi chemistry tree, and Djerassi and Julian were “rivals” in the steroid game during the 40′s and 50′s. Dr. Julian’s body of work ranks him not only as an inspiration to scientists everywhere, but as a Titan. So there you go, the description of the Calabar bean and its use as an ordeal poison all the way up to a life saving drug. Pretty cool stuff. But it’s not entirely unique, as there are poisonous histories behind many old and new medicines, and I’ll get to those in due time. 1. Scheindlin, S. “Episodes in the Story of Physostigmine.” Molecular Interventions 10.1 (2010): 4-10. 2. Miguel MarceloGlatstein, Fatoumah Alabdulrazzaq, Facundo Garcia-Bournissen, and Dennis Scolnik. “Use of Physostigmine for Hallucinogenic Plant Poisoning in a Teenager: Case Report and Review of the Literature.” American Journal of Therapeutics 19 (2012): 384-388. 3. Fraser, T.R. “On the physiological action of the Calabar bean. ” Journal of Anatomy and Physiology 1.2 (1867): 323-332. 4. Black, D. C. “Notes of a Fatal Case of Tetanus Treated by the Calabar Bean.” BMJ 1.531 (1871): 220-21. 5. Hague, J. T. “Calabar Bean in Tetanus, with Cases.” BMJ 2.1087 (1881): 703-04. 6. Cunningham, J. “Case of Traumatic Tetanus Successfully Treated by Calabar Bean.” BMJ 1.692 (1874): 450. 7. Watkins JW, Schwarz EA, Arroyo-Plasencia AM. “The Use of Physostigmine by Toxicologists in Anticholinergic Toxicity” 2014 ACMT Annual Scientific Meeting Research Abstracts and Posters. 8. Hail, Stacey Lynn, Adebisi Obafemi, and Kurt C. Kleinschmidt. “Successful Management of Olanzapine-induced Anticholinergic Agitation and Delirium with a Continuous Intravenous Infusion of Physostigmine in a Pediatric Patient.” Clinical Toxicology51.3 (2013): 162-66. 9. Julian, Percy L., and Josef Pikl. “Studies in the Indole Series. III. On the Synthesis of Physostigmine.” Journal of the American Chemical Society 57.3 (1935): 539-44. Tags: calabar bean, cholinergic, ordeal, physostigmine, poison. Bookmark the permalink. Previous post ← Coprine: Alcohol Poisoning From Mushrooms? Would scopoletin (the coumarin agent from Brunfelsia) also be considered somewhat of an antidote to an anticholinergic like scopolamine? I learned in medical school that the *truth serum” result was due to the fact that an amylase sensitive coating was dissolved off the bean if held in the mouth, as a guilty person might do, so the physostigmine could be absorbed. An innocent person would swallow the bean immediately and it would pass unabsorbed.